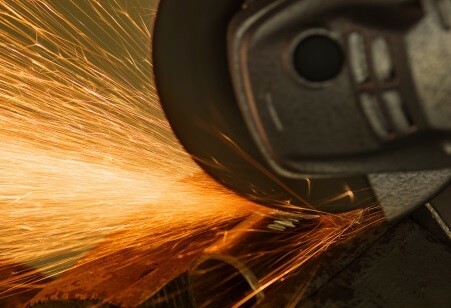 Selecting the right abrasives for your metalworking applications can help you boost productivity, cut costs, and deliver higher quality results. But with the variety of abrasive products available, how do you know you’re choosing the ones best suited for you? 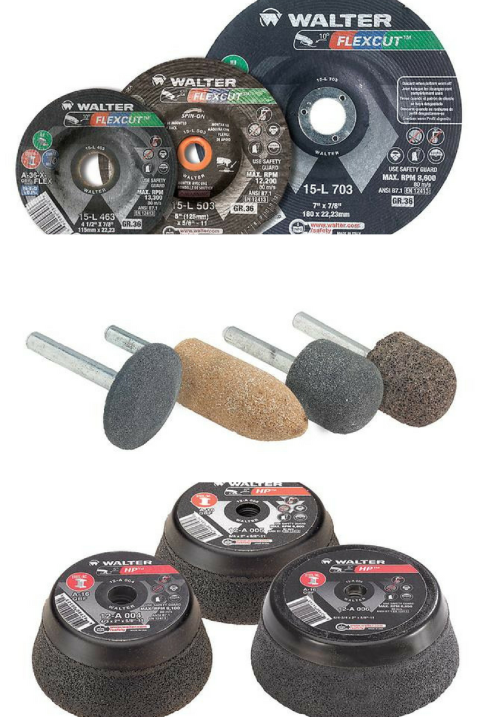 We’ve put together this guide to help you choose the appropriate abrasives and included information about the Walter Abrasive Selector app, a new tool from Walter that makes it easier than ever for you to find abrasives geared for your needs. Aluminum oxide is one of the more common abrasives. It’s preferred for its durability and is ideal for smoothing metal and removing superficial layers of rust. Ceramic is one of the most rugged abrasives used in heavy metal removal applications. Silicon carbide is preferred for non-ferrous metals (copper, bronze, titanium, aluminum, zinc, gold, etc.) and low-tensile-strength materials like cast or ductile iron. Zirconia alumina is optimal for medium metal removal and smoothing, especially if you’re using a high-torque grinder for ferrous metals or high-tensile-strength alloys. Other wheel types you might come across include emery (perfect for polishing) and garnet (the go-to choice for light-duty smoothing and hand-sanding jobs). Straight Wheel: This is the most common type of grinding wheel available. It’s designed with the grinding face (the abrasive area) on the periphery. Recessed Wheel: This resembles a straight wheel, except that the centre is recessed to fit on a machine spindle or flange assembly. Cylinder, Cup, or Dish Wheels: Each of these is named for its shape, but in general they have the cutting faces on their sides. Mounted Wheels: These wheels are typically smaller and come in specialized shapes like plugs or cones. The grit size is the number of individual abrasive grains present in the wheel. The lower the number (10, 16, 24, etc. ), the coarser the grain. Coarser grains are ideal for more demanding tasks like fast cuts or heavy removal. Finer grains with higher counts (70, 100, 180, etc.) are suited for smaller, more detail-oriented jobs including subtle finishes and precise areas. The bond or coating is what holds the abrasive grains together, helping them cut more effectively and gradually wearing away to expose newer, sharper grains. Vitrified bonds are strong, durable, and superior at standing up against harder use conditions and environmental factors. Organic bonds like rubber, resin, or shellac are capable of operating at higher speeds (6,500-9,500 surface feet per minute) and delivering more precise results. The grade (given between A for soft and Z for hard) is what determines how tightly bonds hold the abrasives and can affect the wheel’s speed, grinding depth, feed rates, and more. The general rule of thumb is that softer grades are ideal for harder materials, while harder grades are better for softer materials. Ultimately, finding the right wheel for your needs is about tying all of these factors together—the type of material you’ll be working with, how hard or soft it is, the amount of stock you need to remove, how fast you need to work, the horsepower of the machine you’re using, and other considerations. When in doubt, contact the experts (whether the manufacturer or your supplier) for guidance. Walter’s Abrasives Selector app helps metalworking professionals find the right product for their applications. Click here to download the Walter Abrasives Selector app for Android! Click here to download the Walter Abrasives Selector app for Apple! 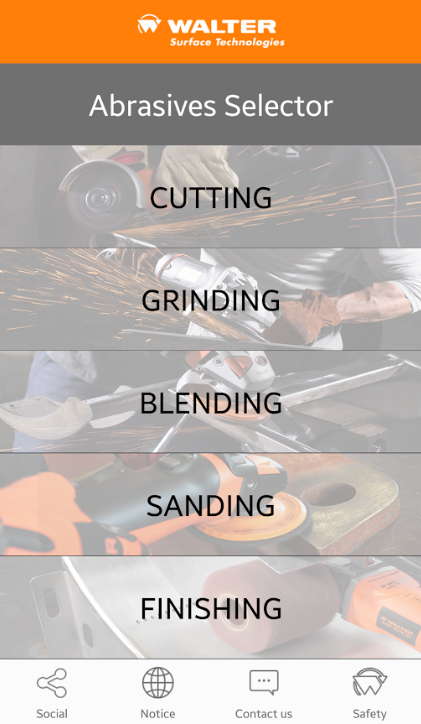 Its user-friendly interface walks you through the process of picking the type of abrasive you need (cutting, grinding, blending, sanding, and finishing), the material you’re working with, and the tool you’re using. It also gives you on-the-go access to downloadable resources like data sheets, technical videos, and more. Do you want to learn more about Walter’s innovative lineup of abrasive products? Contact Fastening House today!